Welcome back to our well-known use case series. It is designed to offer a closer look at business value acceleration – driven by the design principles of SAP S/4HANA. The technology-induced implications of the digital economy are huge, though the technology itself is only a catalyst to achieve a fundamentally different business outcome. The selected use cases, related to SAP S/4HANA Release 1709 are designed to emphasize and visualize the value behind this technological shift, that can be activated by you. 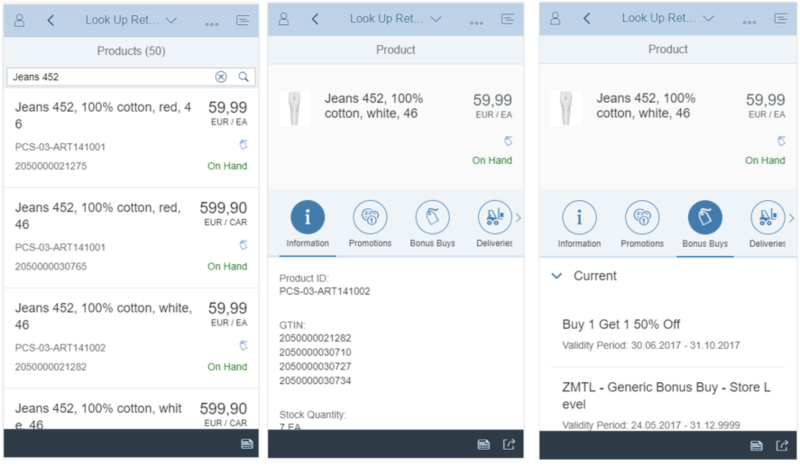 After looking at advanced variant configuration (use case 3a business, 3b technical) of SAP S/4HANA 1709, we will focus on Industry to core, specifically the fashion and vertical business capabilities, in this blog. The fashion market is one of the most important consumer goods markets. In the last few years, the industry has experienced an almost steady growth. But will this positive trend continue also in the future? We see that consumers are getting older as a consequence of the demographic development; the consumer business is getting more and more vertical and the online trade continues to grow. Already today, the fashion market is one of the highest online shares compared with other industries. Therefore, the fashion industry is particularly subject to a comprehensive structural change. Let us have a closer look at these changes and the consequences for the fashion industry focusing on two scenarios – the vertical business and consumer expectations. Analysts are expecting a significant growth of the vertical business and mono-labels in the next couple of years. An increasing number of multinational fashion companies enter the market and expand the range of products offered. Brand manufacturers increasingly rely on their own retail activities, online and offline. Cross-channel retailing primarily benefits from large vertical dealerships as well as manufacturing brands, which are widely distributed, as they, for example, offer sufficient access points for Click & Collect services. The Internet Pure players also increasingly rely on their own brands. The digital economy also enables a more direct link between consumers and manufacturers, and manufacturers are starting to take advantage of this reality. Add to that, in the fashion market competition for the consumers’ favor is immense. Even large companies must prove themselves incessantly, to be innovative and to develop continuously attractive concepts for customers. Mass personalization and functional clothing will become commodity. Consequently, fashion products and services need to be adaptive. Automated manufacturing will enable “Fashion on demand” and the traditional fashion value chain transforms into business networks. For instance, consumer expectations about shopping have changed dramatically in the last few years. Many consumers now take for granted that shopping should be a seamless experience, allowing them to carry out transactions wherever they happen to be, in a store or online. Consumers want the option of ordering a product online, and then picking it up at the store or getting it delivered to their homes. This has created intense pressure not only for fashion retailers to make the shopping experience seamless, and to give consumers new levels of convenience and choice. It also creates enormous cost pressure because of the need to upgrade logistics and handle online transactions. We see from market research, the imperative for traditional fashion retailers is to create a cross-channel offering, one in which their customers have the same experience online as well as in their stores. Customers can move between the two channels without friction. Not only the online and offline channels need to be organizationally combined, but the online and offline operations need also to be well integrated. If a fashion retailer’s channels are to be truly integrated, they must be linked to a single IT platform with a dedicated cross-channel integration layer. The idea of having an intelligent Enterprise is to provide visibility and a seamless experience across all channels, so that, for instance, customers checking the fashion retailer’s website can determine the availability online and, of course also the quantity available of an item in the store. Traditional retailers have still batch systems in place. The fact that the last item of something has been sold won’t necessarily be evident instantly to online shoppers. Customers could show up at the store and discover they’d wasted a trip. There are only few faster ways to get customers frustrated. SAP addresses these challenges with the new SAP S/4HANA 1709 release. SAP S/4HANA offers functionality to solve upcoming market needs and provides significant extensions of functionality and scope for retailers and vertical companies. Industry to core and the support of the fashion and vertical business models are main objectives for the SAP S/4HANA for fashion and vertical business. 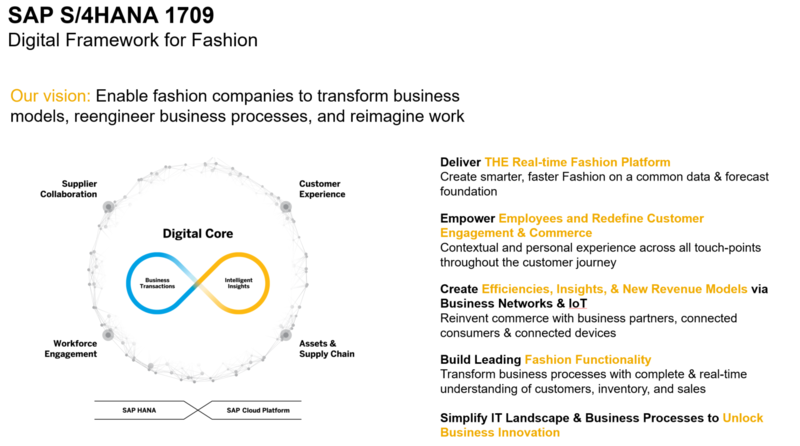 SAP S/4HANA Fashion enables fashion companies to transfer business models, reengineer business processes and reimagine their work, so they can intelligently match their demand and supply, act as an integrated unit and unlock business innovation. If you are interested in more fashion retail input, stay tuned for the technical view blog on fashion retail. All blog posts of this series can be found here. If anyone is interested in how fashion companies are migrating to the new solution, be sure to check out this webinar on how early adopters are approaching their S/4HANA for Fashion and Vertical Business migration.